For every car, truck and motorcycle traveling the busy Canadian roads and highways, there are multitudes of different products available in the marketplace to ensure their optimal performance on a daily basis, just as there is a strong possibility that many of those essential auto-care products were manufactured by Canada’s remarkably successful specialty chemicals producer Recochem Inc. Founded over 60 years ago in Montreal, Recochem is a chemical manufacturer of household products and automotive fluids, featuring a global recognition for quality products and outstanding customer service. When the Austrian-born Joseph Kuchar and family emigrated from Czechoslovakia to Montreal, he quickly embraced the Canadian immigrant dream of a better life, and formed Record Chemical Co. Inc. with his wife. He later shortened the company moniker to Recochem, which initially became involved in the export of bulk chemicals to Europe and South America, as well as to a fast-growing Chinese market. Over the following six decades, the Kuchar family and its long-serving team members built the company into a well-respected multinational producer and packager of specialty chemicals. Via its Consumer Division (Americas), Recochem produces, formulates, contract packages and wholesale distributes household chemicals and automotive fluids from five Canadian locations, including Saint John, N.B., Montreal, Toronto, Edmonton and Vancouver. The company’s most famous sought-after product at one time was naphthalene—more commonly known as mothballs—and while it still processes and packages the pungent product for its customers, it’s no longer the chief revenue generator. 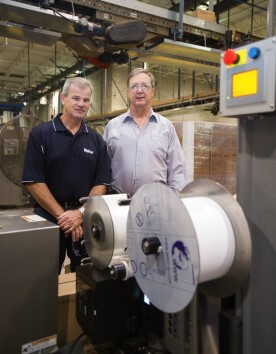 One of the workhorses on the main packaging line at Recochem’s Milton facility is the new Model 5300 label printer-applicator system purchased from Weber Marking Systems Canada, capable of reaching speeds up to 50 boxes per minute. 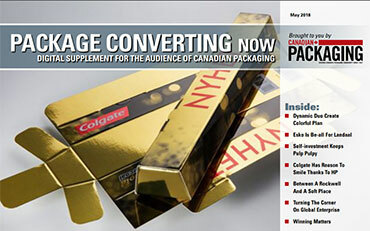 “Nowadays, our Canadian consumer division, supplemented with U.S. contract packaging alliances, has helped us successfully grow our business in the household, automotive and paint sundry chemical business,” Recochem’s Consumer Division, central region plant manager Larry Funnell told Canadian Packaging during a recent visit to the company’s 170,000-square-foot, state-of-the-art facility located in Milton, Ont., about 40 minutes drive west of Toronto. Along with the licensed brands, which make up about 35 per cent of its core business, about 25 per cent of its production is for its own brand of products called Turbo Power washer fluid. The brands seven products include: Windshield Washer –35°C; Windshield Washer –40°C; Premium Washer Fluid and De-Icer –45°C; Bug Wash; Bio-Green Ethanol-based Windshield Washer; Windshield Washer Concentrate; and All Season Windshield Washer. 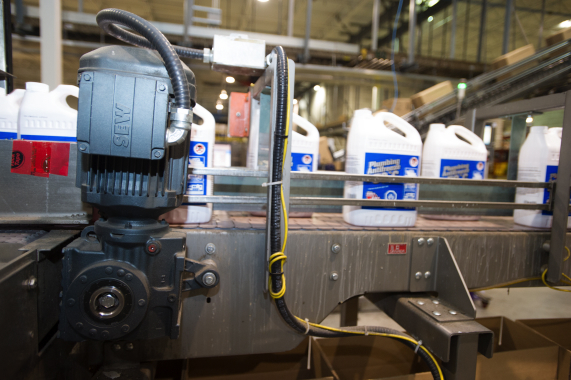 An SEW-Eurodrive motor helps smoothly propel a conveyor line carrying large plastic containers of plumbing antifreeze to the line’s cartoner. The remainder of Recochem’s production comprises third-party manufacturing for Walmart, Esso, Petro Canada, Husky and Canadian Tire. Funnell continues: “Our plant’s blowmolding capabilities for different sizes, along with our in-house graphic design and regulations team are added ways in which Recochem will work with a customer to not only design your packaging, but to also ensure that all regulatory compliances are followed. 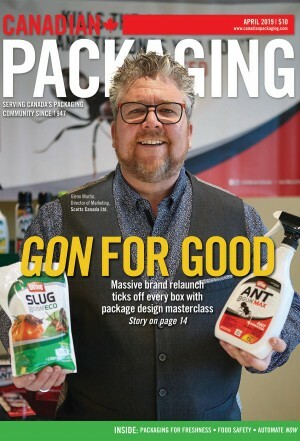 “All of the sites across Canada produce their own HDPE (High-density polyethylene petroleum-based) plastic bottles in a number of sizes, including our proprietary multi-layer co-extruded solvent bottles,” adds Funnell. The Weber 5300 Label Printer-Applicator utilizes easy-to-use computer software, simplifying product changeover, and real-time alterations or adjustments to label data. Funnell notes that all Recochem sites are highly-automated with a plethora of machinery, including blowmolders, filling lines, palletizers and robotic case-packers, which allows it to provide 24-hour operation and a rapid response to any client requests, while maintaining its nationwide ISO standards of product quality. “When we moved into this facility in 2009, we essentially doubled the size in total land space, manufacturing capacity, inventory storage area and office space, and expanded to where we now have about 104 employees,” Funnell relates. While Recochem certainly needed more space to increase its production thanks to the popularity of its products, Funnell was adamant the company would also take an even more stringent look at safety requirements, noting that the manufacture of chemicals can indeed present a hazardous working environment. “We spent about $750,000 on safety features here at the Milton facility,” notes Funnell, adding it fully follows CSA (Canadian Standards Association) standards, and all PSR (Pre-start Health and Safety) requirements. 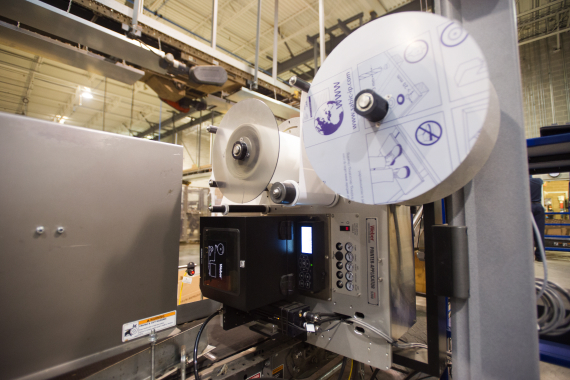 Using air-blow tamp configuration where the label is blown onto the carton, the model 4300 label printer-applicator from Weber normally runs at a rate of 25 labels per minute. The filling room, as expected, is highly-ventilated, and is continuously automatically monitored for LEL (lower explosive level) possibility. “Recochem is extremely serious about the volatility of its products and for the safety of our employees, as such when the LEL monitors reach the 10 per cent level, an alarm will go off, and we will monitor the situation to see where the problem is,” Funnell relates. In the event of the worst-case scenario, the facility can utilize an advanced multiple high-=capacity sprinkler system consisting of water, foam and ESFR. All in all, the plant is doing a very healthy business, as it also makes its own bottles, fills and labels them and ships them out seven-days-a-week, 24-hours-a-day. Funnell says that when it moved into the Milton plant five years ago, Recochem upgraded each of its five blowmolding machines, adding that the plan is to “hopefully expand” in that area of production soon. “At our Milton facility here, we do all the one-, four- and 10-liter containers, as well as the 1,000-liter totes, 215-gallon drums and also full loads for tanker trucks for certain customers,” Funnell says. One of several Nordson ProBlue 10 hot-melt adhesive applicating systems used to seal corrugated cartons. 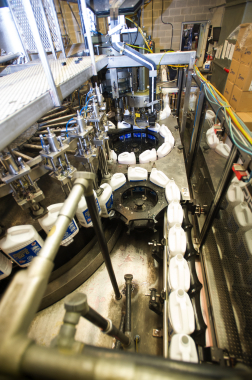 The Milton facility currently houses five liquid-filling lines, two powder-filling lines and has some manual filling capacities. Its main production line, aptly named Line No. 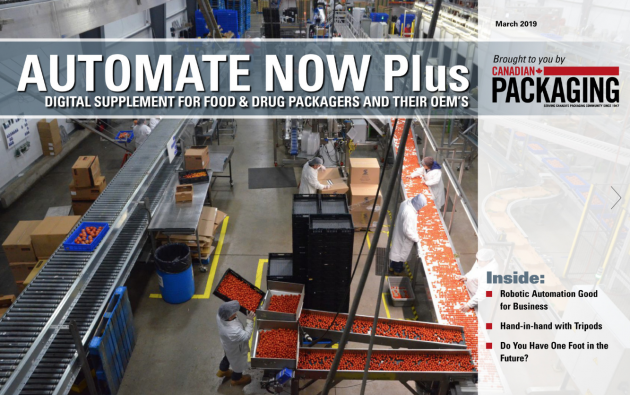 1, boasts a capacity of filling, capping and labeling some 650,000 liters of liquid product every 24 hours, according to Funnell. 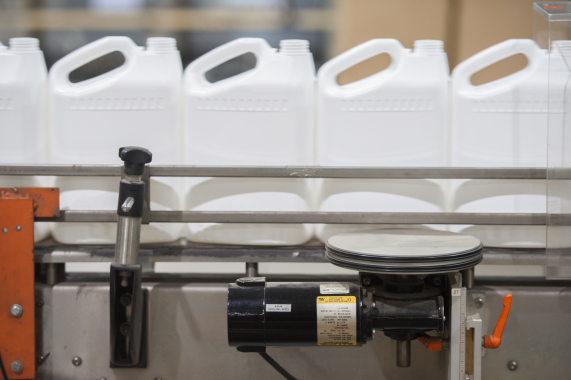 Further downstream, Recochem places a product label onto each carton by its label printer-applicator supplied by Weber Marking Systems Canada. 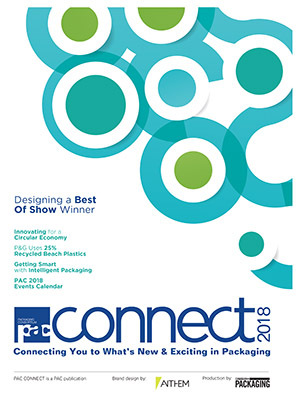 “Fairly recently, we had a customer request for scanable bar codes, and although we had some great help from Atlantic Packaging who supply us with the corrugated, the customer said they needed us to provide a high-speed capacity of up to 50 boxes per minute with great print quality,” explains Funnell. All in all, Funnell and Recochem were sufficiently impressed with the label print-and-apply technology of the Weber system, purchasing and installing eight machines in March of 2014 at its Milton and Montreal facilities—seven Weber model 4300 units, and one model 5300 system. All units equipped with print engines manufactured by Zebra Technologies. Fitted with wireless Zebra print engines. 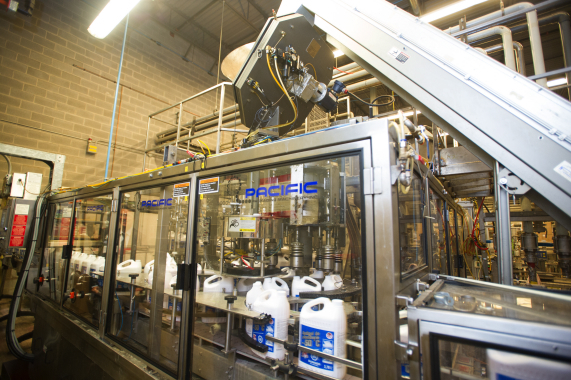 Supplied by agent Alex E. Jones & Associates, a model 28V09 filling and capping system from Pacific Packaging Machinery (see above and below) filling four-liter plastic containers with windshield washer fluid at Recochem’s Milton facility. Says Moore, “The speed of these Weber units is variable, depending on how fast the customer wants to run it. Funnell points out that the model 4300 is a low-speed label printer-applicator system, which the Milton facility only tends to run at a comfortable rate of eight to 10 boxes per minute. “We generally run the Weber model 5300 at around 35 to 40 cases per minute, but for that one client who wants it, we can easily hit its target speed of 50 units per minute,” Funnel relates. The Weber model 5300 label printer-applicator is also very versatile—offering customers a wide range of high-quality print engines with an equally wide range of optional print resolutions and label dispensing rates. Significantly, Weber has now made it available with an upgradeable RFID (radio frequency identification) print encoding ability, though Recochem did not purchase that option. 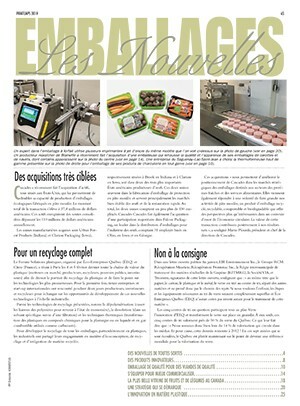 “With the 5300 we can print and apply labels with barcodes onto a wide range of surfaces, such as the plastic containers, corrugated cases, or even on the various formats of pallets, if we chose to,” says Funnell, adding the adhesive labels can be applied in a variety of manner: top, bottom, sides, and even across corners for whatever happens to provide best scanning performance. Other formidable examples of the 5300’s versatility include the myriad number of ways it can be configured depending on the user’s labeling requirements: tamp-blow; air-blow; direct-tamp; swing-tamp; corner-wrap; dual label; and electric tamp-blow. All of the label printer-applicator purchased by Recochem employ the air-blow method, whereby the label is blown onto the product from a fixed distance—without utilizing a pneumatic cylinder. A Model 835 case-packer manufactured by Hartness International was purchased by Recochem from Canadian agents Alex E. Jones & Associates. Other value-added features of the 5300 system include a microprocessor controller and downloadable firmware capabilities, plenty of different inputs/outputs, and a robust construction to withstand harsh industrial environs. 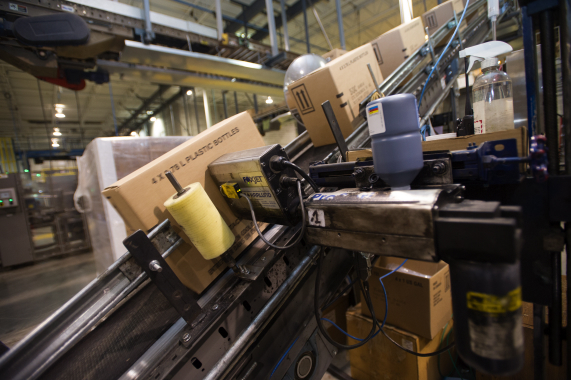 Standard features include a remote locatable controller connected via a 15-foot cable, which allows the operator more convenience when monitoring the label printer-applicator’s workflow, such as label application, pad sensor settings, alert lights, or the status of the label roll or printer ribbon. Moreover, companies like Recochem are able to easily monitor the full operational status and configuration of the 5300 unit, by simply logging into a Web page unique to each individual 5300 system. 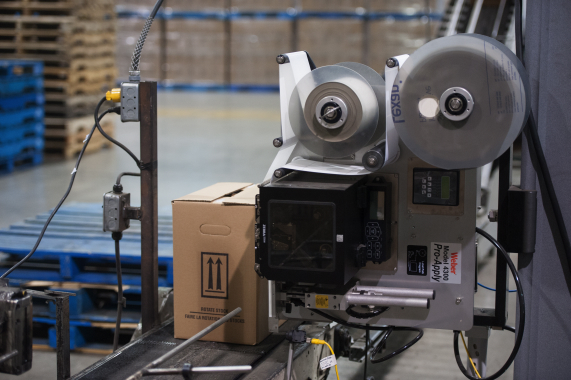 The unit also features an intelligent computer-controlled unwind and rewind function that ensures the labels match the ribbon supply at the same rate, thereby avoiding the double downtime possibility for changeover. “Also helpful to us, owing to the different-sized products and the different all-round products we place through Line No. 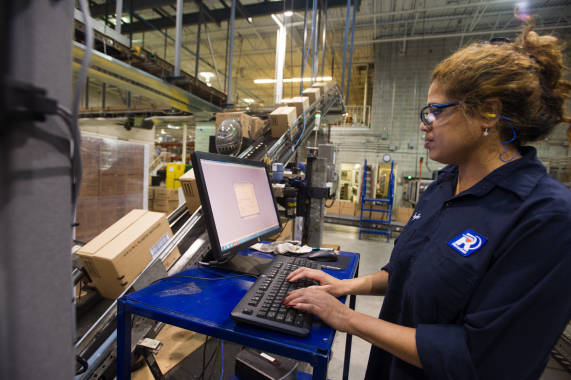 1, is the fact we can easily store our printing requirements in the 5300’s memory, making it very easy for the operator to select the requisite job from the applicator rather than having to download it from the computer,” Funnell relates. Funnels adds that while he is extremely pleased at how well the Weber printer-application units are working at both facilities, he says he was equally impressed by how quickly Recochem was able to take possession of the systems. “It really was a quick turnaround, and I think it surprised all of us here at Recochem,” recalls Funnell. The Columbia Machine HL6000 series high-level palletizer manufactured by Columbia Machine easily loads over 60 cases of product per minute onto the signature blue wood CHEP pallets. 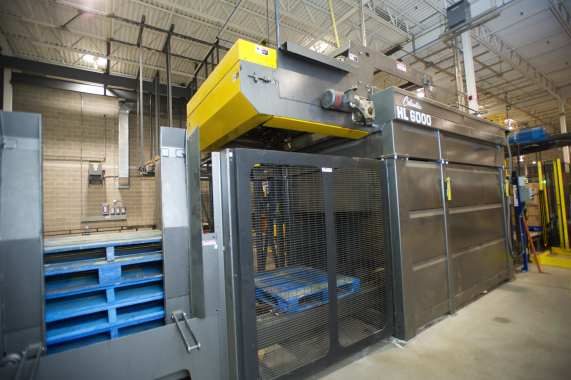 Another key piece of technology utilized at Recochem, is the HL6000 series high-level palletizer designed and manufactured by Columbia Machine, Inc. which is capable of palletizing 60 or more cases per minute while providing a tight, square and stable load. Says Funnell: “We installed the Columbia HL6000 in 2009 and we have been very happy with it from the outset. 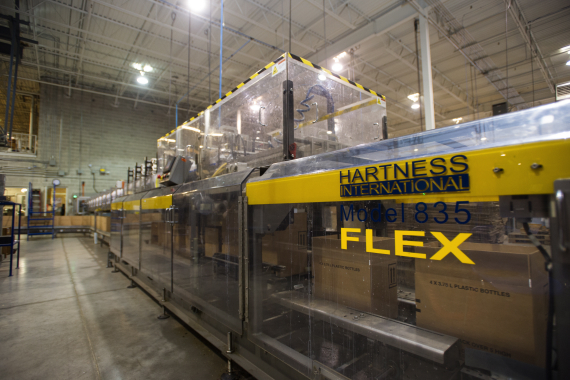 The Columbia HL6000 palletizer comes standard with such controls as Rockwell International’s Allen-Bradley Compact Logix PLC (programmable logic controller), a PanelView Plus 600 Color touchscreen interface and Columbia’s own Project Manager software, all of which help make it easy to control and care for. Funnell says that the folks at Columbia Machine continue to be very easy to work with whenever called upon, and the fact that they are very knowledgeable and offer reasonably priced parts is a bonus. A Foxjet inkjet printer supplied by Harlund Industries applies large-character product codes to the cartons. “One day when we did have an issue, it was quickly resolved as they were able to help us troubleshoot the HL6000 over the telephone, as well as by connecting into the PLC,” Funnell relates. After palletizing by the HL6000 is completed, the product is conveyed to an overhead stretchwrapper manufactured by M.J.Maillis/Wulftec. 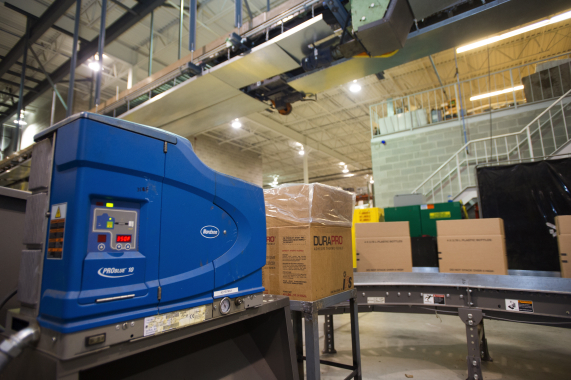 A Baldor motor helps ensure smooth-running operations for conveyor lines at the Milton plant. CHEP-supplied pallets for national and international transport of product. Funnell says that the recent capital expenditure moves by Recochem are indeed a great sign for the company’s long-term future, showing that workplace safety is deemed as important as being profitable. He adds that the company is also aware of its environmental responsibilities locally, and has gone to great lengths when designing the facility to ensure that when it comes to its water usage, it actually recycles and reuses it. “Nothing is ever dumped down the drains, because we have a closed drain system in place,” he states. 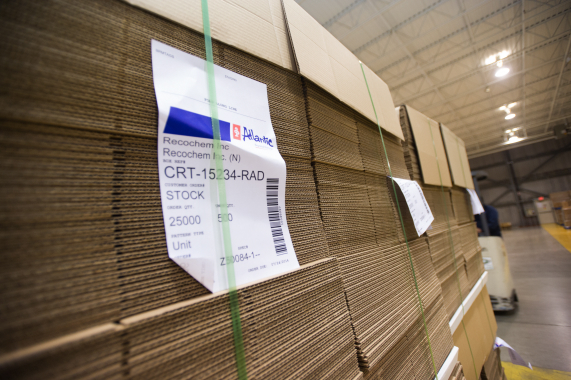 Atlantic Packaging Products supplies the corrugated cartons to pack the containers of consumer chemicals at Recochem. Summing up, Funnell recalls that when Recochem first moved into the Milton facility, and that despite the production flow working smoothly, it still took about a year-and-a-half for the stress level to leave the building. Notably, none of that stress came back with the introduction of the Weber label equipment, he points out. “I think there’s still a learning curve for the operators on these machines—as we continue to experiment with ways to make our unique situation even more efficient—but so far, the Weber machines have been working very well for us and I know everyone involved is quite happy with its performances,” he concludes.